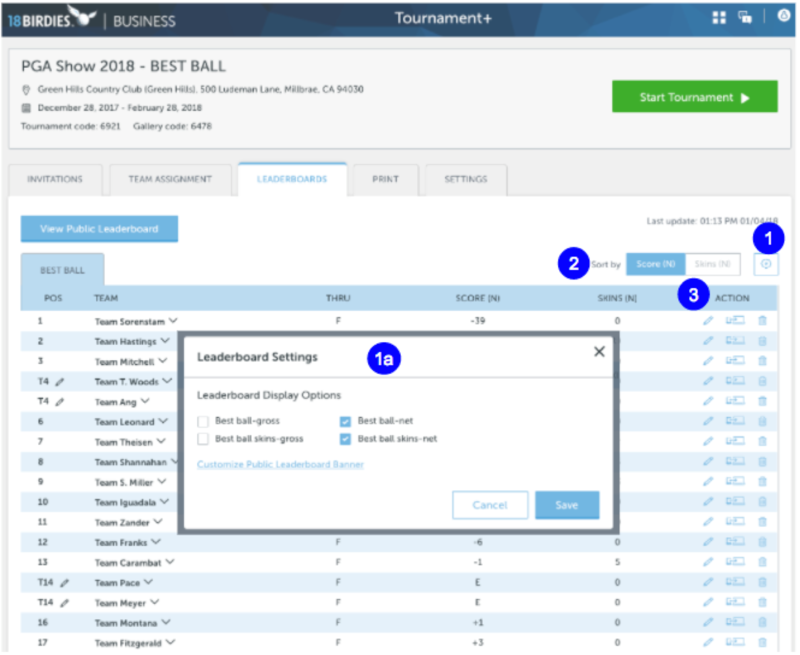 The Leaderboards Tab is designed for you, the organizer, to make edits to a player or team’s score, adjust the position by manually breaking ties, take over scoring for a player or team, sort the leaderboard, adjust the display, and finally remove a player or team from the Leaderboard. The "Name" column on the Leaderboard will either be the Individual Player Name or a Team name, depending on the format of your tournament and the Leaderboard options you have selected. 1. Display Options - Click the settings wheel on the far right side of the screen to adjust the Leaderboard display options. a. The options available to you will be Gross, Net, Skins Gross, and Skins Net. These options will not always be available to you if you did not choose to enable a Net game or a Gross/Net Skins game during the setup process of your tournament. With that said, you can enable them from the Settings Tab, as long as your tournament has not started yet, and you have not chosen "Organizer Manages Scoring" for any of the teams in the Team Assignment tab. You will see that as you choose to enable and disable different display options, i.e. gross and/or net, you will see the columns you choose to enable displayed on the Leaderboard. 2. Sort by - Depending on the Leaderboard options you have chosen to enable, you will be able to sort the Leaderboard by simply clicking which option you want to sort by. 3. Action - On the far right column of the Leaderboard, you will see different actions you can take. a. The first (pencil icon) is to edit a player or teams score. Simply click the pencil and you will be able to edit or enter a player/teams score. b. The second option is to take over a player/teams scorecard. Choosing to do this will prevent that player or team from managing their scores from the app for the remainder of the tournament. c. The last option underneath the Action column is to trash a player/team. If you choose to trash a team, the entire team (all players, even in an individual stroke play event) on the team or in the pairing group, will be removed from the Leaderboard, removed from the assigned team in the Team Assignments tab, and all scores entered to that point will be deleted. 4. 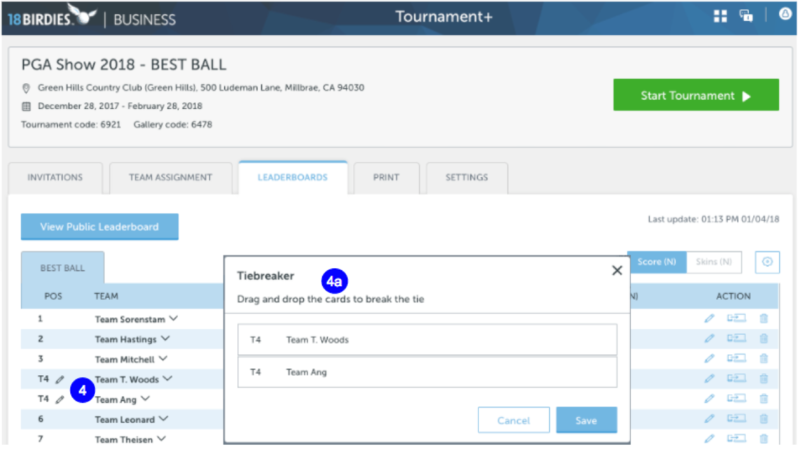 Breaking Ties - As scores are being entered throughout your tournament, player or team positions will update automatically in real time on the Leaderboard. The order in which they are displayed will be dependent on the Leaderboard options you have enabled and which option you have chosen to sort by. If you chose an auto tiebreaker, i.e. USGA recommended method, ties break automatically as soon as all players or teams in your tournament have completed all holes (once the "Thru" hole reads "F" for finished). Prior to that, ties will be shown as ties on the Leaderboard (POS T1 for example). Occasionally the auto tiebreaker method you choose does not break a tie. For example, if you choose the USGA auto tiebreaker method, the tie is broken by comparing the player or teams last 9 holes, last 6, last 3, then finally the 18th hole. If making these comparisons the software finds that the player or team is still tied, the position on the leaderboard will remain tied. In that case, you will need to manually break the tie. a. Manually Breaking Ties - In order to break a tie manually, simply click the pencil icon below POS next to either of the player or team that is tied on the Leaderboard. In the window that pops open, drag the players or teams that are tied into the order you wish them to be positioned on the Leaderboard, and click Save. You will see that their positions updated on the Leaderboard. If for some reason you need to reset the tie(s) or reorder the positions, click the pencil again to reorder or 'reset tie(s)', and click Save. If you plan to display a Leaderboard via a projector or TV (or some other display), first click the View Public Leaderboard link at the top left of the Leaderboards tab. You have a few different options for displaying the public Leaderboard. 1. Sorting - Just as with the tournament organizer Leaderboard view, you have the ability to sort the Public Leaderboard by Gross, Net, or Skins Gross or Net, depending on the Leaderboard options you have selected. 2. Scrolling - With a large number of players or teams on your Leaderboard, you may wish to have the Leaderboard scroll from top to bottom. Simply click the Scroll link in the upper right corner and choose None, Slow, Normal, or Fast to start the Leaderboard scrolling. Note: The Leaderboard will not scroll unless the number of players displayed exceed the viewing area. *The Leaderboard will only scroll when your web browser zoom is at 100% or greater. If you zoom out to anything less than 100%, the leaderboard will not scroll. 3. 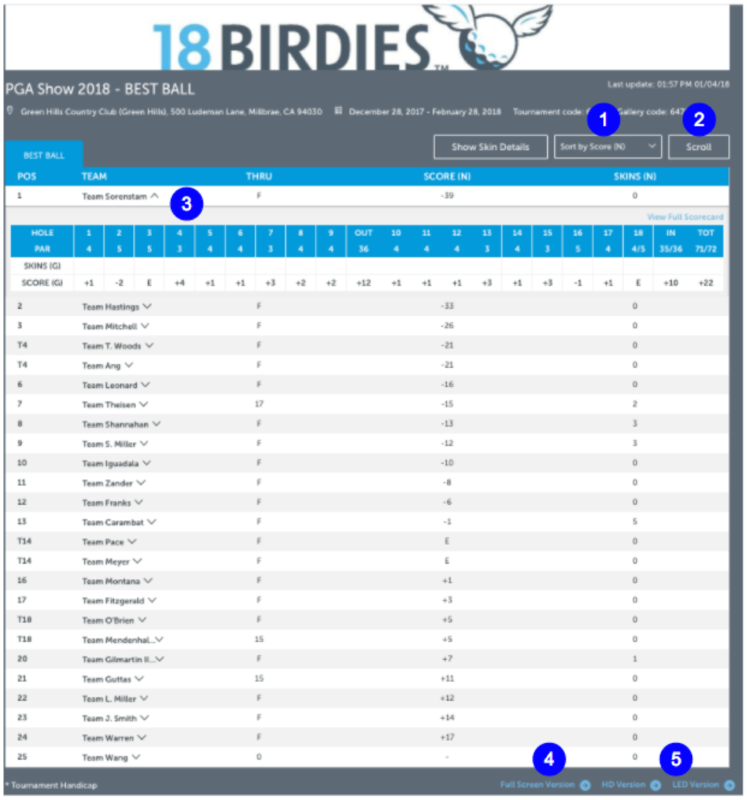 View Scorecard Details - In order to display each player or teams full scorecard details on the Leaderboard, simply click a player or teams name and the details should be displayed for view. 4. Full Screen - This Leaderboard version is designed to be displayed on a large TV or projector. There are two versions here, the Public Leaderboard that shows some tournament details and the banner space in the header area, and the Full-Screen version that expands the viewing area of the Leaderboard. The Full-Screen version also allows the organizer the functionality of adjusting Font Size (Click the 'Aa' icon to do so). Pro Tip - When you are displaying your Leaderboard on a separate display (TV monitor, projector, etc. ), in your display settings choose the option of ‘Use as Separate Display’. This way you as the organizer will be able to edit scores and manage your Leaderboard from the T+ edit screen, and display the Public Leaderboard on a separate display at the same time. The edits you make on the back end will update on the Public Leaderboard in real time. *Available to Individual Stroke Play events only. The cut will not apply to the Flights Leaderboard. In order to add a cut line to your Leaderboard, scroll to the bottom of the page while on the Leaderboards tab, and click the Add Cut Line link in the bottom right corner of your page. Enter the number of players/teams (including ties) that you wish to make the cut and click Add. You will then see a preview of where the Cut line will go. If you are satisfied with the position of the line, click Perform Cut and Confirm. Once you confirm, you will no longer be able to go back and edit this Cut line. All positions below the number you choose will be CUT. You can add up to two (2) Cut lines per tournament. All Cut players will receive a notification in the app that they were Cut. Also, you as the tournament organizer will no longer have the ability to edit the score, take over scoring, or trash a player or team that has been Cut. Performing a Cut only affects players or teams that are currently on the Leaderboard and their current score to par at the time is below the chosen number to keep above the Cut line. Cut players or teams will also forever remain below the Cut line. For example, if you perform a Cut while a player/team has not finished their round, but their score to par has them below the proposed Cut line, even if that player or team continues to score their round and improves their score, they will remain below the Cut line and in CUT position on the Leaderboard. Pro Tip - It is best practice to wait to add a Cut line until after all players or teams have finished their round(s). This will prevent you from accidentally Cutting a player or team that finishes above the performed Cut line. Note: Adding a Cut line is only available in Individual Stroke Play and Stableford round formats.